Sonoma State University professor Lynn Cominsky is part of the team that made the observation. The gravitational waves were detected on September 14, 2015 at 5:51 a.m. Eastern Daylight Time (9:51 UTC) by both of the twin Laser Interferometer Gravitational-wave Observatory (LIGO) detectors, located in Livingston, Louisiana, and Hanford, Washington, USA. The LIGO Observatories are funded by the National Science Foundation (NSF), and were conceived, built, and are operated by Caltech and MIT. The discovery, accepted for publication in the journal Physical Review Letters, was made by the LIGO Scientific Collaboration (which includes the GEO Collaboration and the Australian Consortium for Interferometric Gravitational Astronomy) and the Virgo Collaboration using data from the two LIGO detectors. At Sonoma State University, physics and astronomy professor Lynn Cominsky has been involved with the LIGO experiment since 2007, when she was asked to serve on LIGO's Program Advisory Committee (PAC), providing expertise with respect to the education and outreach programs undertaken by the LIGO Scientific Collaboration (LSC). After her 3-year term on the PAC ended, she was so enthusiastic about LIGO's scientific potential she asked to join the LSC, and currently serves as the chair of its Formal Education Working group. Under her direction, members of SSU's Education and Public Outreach group have produced a short Educator's Guide for classroom use to explain the exciting discovery, which will be linked from the LIGO main website and available at https://www.ligo.caltech.edu/system/media_files/binaries/303/original/ligo-educators-guide.pdf, as well as an image for Astronomy Picture of the Day (http://apod.nasa.gov). "I am thrilled to be a small part of the LIGO outreach effort. 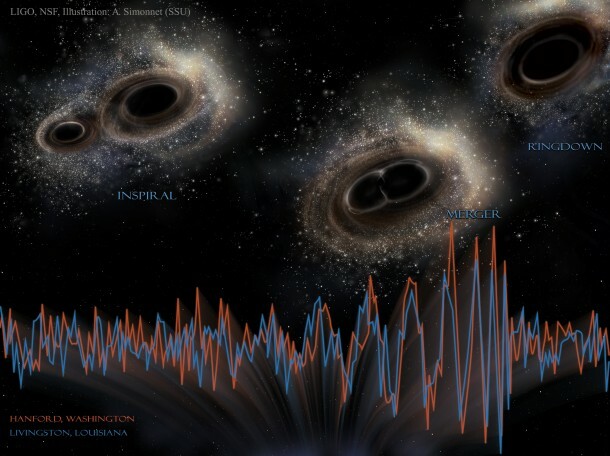 Studying black holes has been most of my life's work, and the discovery of gravitational waves using LIGO detectors will open an entirely new branch of astronomy," said Cominsky. It's been a busy year so far for Cominsky, was honored with the $20,000 Wang Award and two other astronomy education awards earlier this year. Based on the observed signals, LIGO scientists estimate that the black holes for this event were about 29 and 36 times the mass of the sun, and the event took place 1.3 billion years ago. About three times the mass of the sun was converted into gravitational waves in a fraction of a second--with a peak power output about 50 times that of the whole visible universe. By looking at the time of arrival of the signals--the detector in Livingston recorded the event 7 milliseconds before the detector in Hanford--scientists can say that the source was located in the Southern Hemisphere. The existence of gravitational waves was first demonstrated in the 1970s by Russell Hulse and Joseph Taylor, Jr., who discovered in 1974 a binary system composed of a pulsar in orbit around another star, later found to be a neutron star. They found that the orbit of the pulsar was slowly shrinking over time because of the release of energy in the form of gravitational waves. For their work, Hulse and Taylor were awarded the Nobel Prize for Physics in 1993. The Hulse-Taylor binary system will meld into a black hole 300 million years from now. In the measurement just made, LIGO directly observed the gravitational waveform from the end of the life of a binary system made of two black holes, giving a sketch in time of the final fractions of a second of this binary system as it became a single black hole. "Our observation of gravitational waves accomplishes an ambitious goal set out over 5 decades ago to directly detect this elusive phenomenon and better understand the universe, and, fittingly, fulfills Einstein's legacy on the 100th anniversary of his general theory of relativity," says Caltech's David H. Reitze, executive director of the LIGO Laboratory. LIGO research is carried out by the LSC, a group of more than 1,000 scientists from universities around the United States and in 14 other countries. More than 90 universities and research institutes in the LSC develop detector technology and analyze data; approximately 250 students are strong contributing members of the collaboration. The LSC detector network includes the LIGO interferometers and the GEO600 detector. The GEO team includes scientists at the Max Planck Institute for Gravitational Physics (Albert Einstein Institute, AEI), Leibniz Universität Hannover, along with partners at the University of Glasgow, Cardiff University, the University of Birmingham, other universities in the United Kingdom, and the University of the Balearic Islands in Spain. The discovery was made possible by the enhanced capabilities of Advanced LIGO, a major upgrade that increases the sensitivity of the instruments compared to the first generation LIGO detectors, enabling a large increase in the volume of the universe probed--and the discovery of gravitational waves during its first observation run. The U.S. National Science Foundation leads in financial support for Advanced LIGO. Funding organizations in Germany (Max Planck Society), the U.K. (Science and Technology Facilities Council, STFC) and Australia (Australian Research Council) also have made significant commitments to the project. Several of the key technologies that made Advanced LIGO so much more sensitive have been developed and tested by the German UK GEO collaboration. Significant computer resources have been contributed by the AEI Hannover Atlas Cluster, the LIGO Laboratory, Syracuse University, and the University of Wisconsin-Milwaukee. Several universities designed, built, and tested key components for Advanced LIGO: The Australian National University, the University of Adelaide, the University of Florida, Stanford University, Columbia University of New York, and Louisiana State University. "The Advanced LIGO detectors are a tour de force of science and technology, made possible by a truly exceptional international team of technicians, engineers, and scientists," says David Shoemaker of MIT, the project leader for Advanced LIGO. "We are very proud that we finished this NSF-funded project on time and on budget." At each observatory, the two-and-a-half-mile (4 km) long L-shaped LIGO interferometer uses laser light split into two beams that travel back and forth down the arms (four-foot diameter tubes kept under a near-perfect vacuum). The beams are used to monitor the distance between mirrors precisely positioned at the ends of the arms. According to Einstein's theory, the distance between the mirrors will change by an infinitesimal amount when a gravitational wave passes by the detector. A change in the lengths of the arms smaller than 1/10,000th the diameter of a proton can be detected. astronomy," says David McClelland, professor of physics and director of the Centre for Gravitational Physics at the Australian National University.